Full-time life on a narrowboat is a novelty for so many of us, and is endlessly fascinating. How do people downsize their lives and belongings into what looks like a large, crayon-coloured floating toy-box? Narrowboat Life answers all the questions we've wanted to ask about the ins and outs of liveaboard life on the inland waterways. 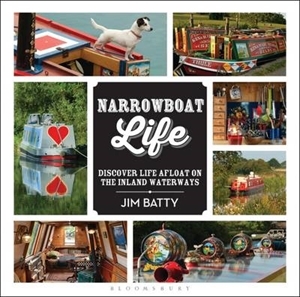 The book is filled with beautiful, enthralling photography of the waterways themselves, the narrowboats that occupy them and, most importantly, every nook and cranny of their insides. Should you become seduced, the author gives solid hands-on advice about how to make a narrowboat your home. Accompanying these absorbing images, the playful and always informative text satisfies our curiosity to know, among other things: * How do you fit all of your stuff into such a restricted space? * How much does a narrowboat cost? * How do you hold down a job if you're always on the move? * Does s/he (the cat, dog, parrot) live on the boat as well? * Is it cold in the winter? Jim Batty has lived, worked and continuously cruised a 53-foot narrowboat with his partner and their cat for the past six years. The book answers a distillation of all the queries he has fielded on an almost daily basis since moving aboard - through towpath and lockside conversations with young couples, those close to retirement, single men and women of all ages, young families, tourists, as well as talking with a host of inquisitive (and initially uncomprehending) friends, relatives and colleagues. Everyone, it seems, wants to know exactly what the live aboard life is like: inside and out.